Having the ability or capacity to change or vary. Being capable of alternation in various ways, such as variable seasons or variable winds, e.g. a shifting wind varying in force. In a programming language Data Types are a classification on the set of all possible data. This classification is based on the possible values of the types and the operations which can be performed on them. Most programming languages come with basic data types like integer, real, float od boolean. In programming languages like C, C++ or Java, there is a one-to-one correspondence between data types and a varialbe name. This is different in Python, where a variable name corresponds to the objects it references. The module Numpy has to take the traditional approach to data types, see the chapters Data Types and Variables" and Data Types and Variables" of our numpy tutorial. You have programmed low-level languages like C, C++ or other similar programming languages? Therefore, you might think you know already enough about data types and variables? You know a lot that's right, but not enough for Python. So it's worth to go on reading this chapter on data types and variables in Python. There is a dodgy differences in the way Python and C deal with variables. There are integers, floating point numbers, strings, and many more, but things are not the same as in C or C++. If you want to use lists or associative arrays in C e.g., you will have to construe the data type list or associative arrays from scratch, i.e., design memory structure and the allocation management. You will have to implement the necessary search and access methods as well. Python provides power data types like lists and associative arrays, called dict in Python, as a genuine part of the language. So, this chapter is worth reading both for beginners and for advanced programmers in other programming languages. This subchapter is especially intended for C, C++ and Java programmers, because the way these programming languages treat basic data types is different from the way Python does it. Those who start learning Python as their first programming language may skip to the next subchapter. So, what's a variable? As the name implies, a variable is something which can change. A variable is a way of referring to a memory location used by a computer program. In many programming languages a variable is a symbolic name for this physical location. This memory location contains values, like numbers, text or more complicated types. We can use this variable to tell the computer to save some data in this location or to retrieve some data from this location. 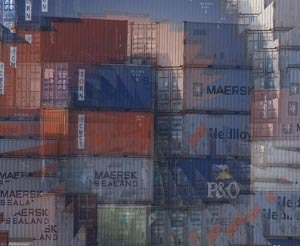 A variable can be seen as a container (or some say a pigeonhole) to store certain values. While the program is running, variables are accessed and sometimes changed, i.e., a new value will be assigned to a variable. What we have said so far about variables best fits the way variables are implemented in C, C++ or Java. Variable names have to be declared in these languages before they can be used. Such declarations make sure that the program reserves memory for two variables with the names x and y. The variable names stand for the memory location. It's like the two empty shoeboxes, which you can see in the picture on the right side. 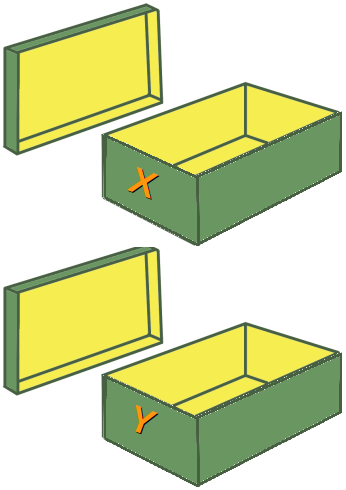 These shoeboxes are labelled with x and y. Like the two shoeboxes, the memory is empty as well. Putting values into the variables can be realized with assignments. The way you assign values to variables is nearly the same in all programming languages. In most cases the equal "=" sign is used. The value on the right side will be saved in the variable name on the left side. 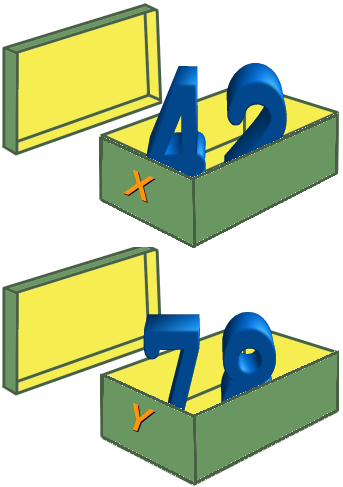 We will assign the value 42 to both variables and we can see that two numbers are physically saved in the memory, which correspond to the two shoeboxes in the following picture. 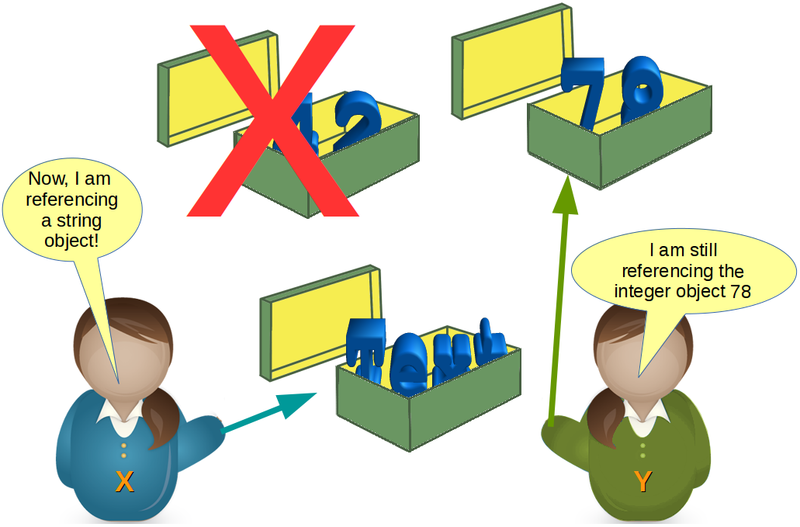 We think that it is easy to understand what happens, if we assign a new value to one of the variables, let's say the value 78 to y. We have exchanged the content of the memory location of y. We have seen now that in languages like C, C++ or Java every variable has and must have a unique data type. E.g., if a variable is of type integer, solely integers can be saved in the variable for the duration of the program. In those programming languages every variable has to be declared before it can be used. Declaring a variable means binding it to a data type. It's a lot easier in Python. There is no declaration of variables required in Python. It's not even possible. If there is need of a variable, you think of a name and start using it as a variable. Another remarkable aspect of Python: Not only the value of a variable may change during program execution but the type as well. You can assign an integer value to a variable, use it as an integer for a while and then assign a string to the same variable. 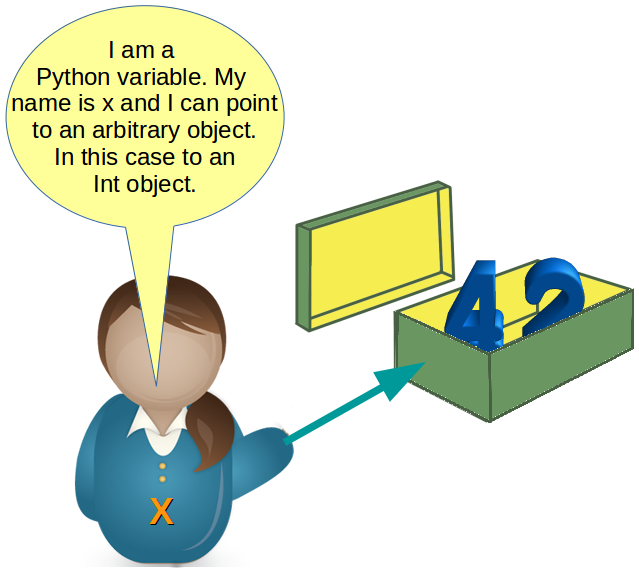 When Python executes an assignment like "i = 42", it evaluates the right side of the assignment and recognizes that it corresponds to the integer number 42. It creates an object of the integer class to save this data. If you want to have a better understanding of objects and classes, you can but you don't have to start with our chapter on Object-Oriented Programming. This means that Python automatically takes care of the physical representation for the different data types. As variables are pointing to objects and objects can be of arbitrary data type, variables cannot have types associated with them. This is a huge difference to C, C++ or Java, where a variable is associated with a fixed data type. This association can't be changed as long as the program is running. >>> x = "Now x references a string"
Most probably, we will see further changes to the variables in the flow of our program. There might be, for example, a string assignment to the variable x. 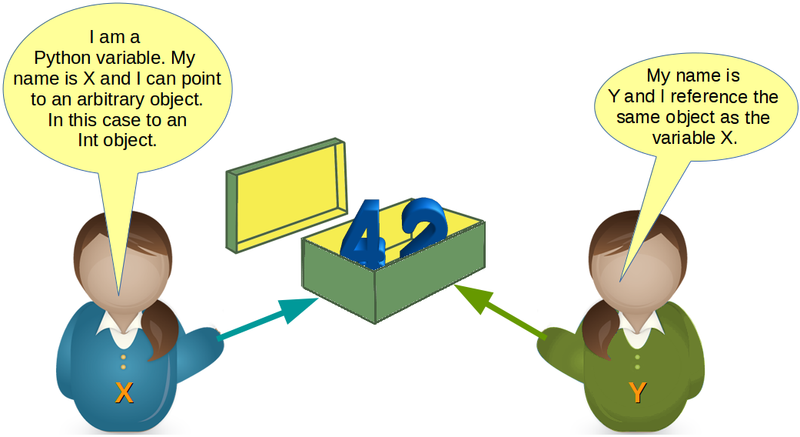 The previously integer object "42" will be orphaned after this assignment. It will be removed by Python, because no other variable is referencing it. You may ask yourself, how can we see or prove that x and y really reference the same object after the assignment y = x of our previous example? The identity function id() can be used for this purpose. Every instance (object or variable) has an identity, i.e., an integer which is unique within the script or program, i.e., other objects have different identities. The naming of variables follows the more general concept of an identifier. A Python identifier is a name used to identify a variable, function, class, module or other object. A variable name and an identifier can consist of the uppercase letters "A" through "Z", the lowercase letters "a" through "z" , the underscore _ and, except for the first character, the digits 0 through 9. Python 3.x is based on Unicode. This means that variable names and identifier names can additionally contain Unicode characters as well. Identifiers are unlimited in length. Case is significant. The fact that identifier names are case-sensitive can cause problems to some Windows users, where file names are case-insensitive, for example. Exceptions from the rules above are the special Python keywords, as they are described in the following paragraph. We saw in our chapter on "Valid Variable Names" that we sometimes need names which consist of more than one word. We used, for example, the name "maximum_height". The underscore functioned as a word separator, because blanks are not allowed in variable names. Some people prefer to write Variable names in the so-called CamelCase notation. We defined the variable MinimumHeight in this naming style. There is a permanent "war" going on between the camel case followers and the underscore lovers. Personally, I definitely prefer "the_natural_way_of_naming_things" to "TheNaturalWayOfNamingThings". I think that the first one is more readable and looks more natural language like. In other words: CamelCase words are harder to read than their underscore counterparts, EspeciallyIfTheyAreVeryLong. This is my personal opinion shared by many other programmers but definitely not everybody. The Style Guide for Python Code recommends underscore notation for variable names as well as function names. "All identifiers in the Python standard library MUST use ASCII-only identifiers, and SHOULD use English words wherever feasible (in many cases, abbreviations and technical terms are used which aren't English). In addition, string literals and comments must also be in ASCII. The only exceptions are (a) test cases testing the non-ASCII features, and (b) names of authors. Authors whose names are not based on the latin alphabet MUST provide a latin transliteration of their names." Companies, institutes, organizations or open source projects aiming at an international audience should adopt a similar notation convention! created in the application by the programmer. So we have different "kinds" of objects for different data types. We will have a look at the different built-in data types in Python. Hexadecimal literals have to be prefixed either by "0x" or "0X". "true division" performed by "/"
"floor division" performed by "//"
The operator "//" performs floor division, i.e., the dividend is divided by the divisor - like in true division - but the floor of the result will be returned. The floor is the largest integer number smaller than the result of the true division. This number will be turned into a float, if either the dividend or the divisor or both are float values. 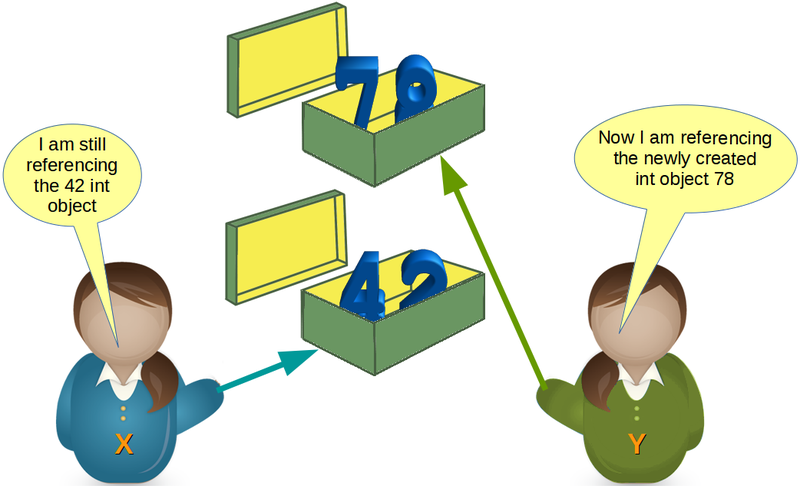 If both are integers, the result will be an integer as well. In other words, "//" always truncates towards negative infinity. Connection to the floor function: In mathematics and computer science, the floor function is the function that takes as input a real number x and returns the greatest integer floor ( x ) = ⌊ x ⌋ that is less than or equal to x. The task of the first-generation computers in the forties and fifties had been - due to technical restraints - focused on number processing. Text processing had been just a dream that time. Nowadays, one of the main tasks of computers is text processing in all its varieties; the most prominent applications are search engines like Google. To enable text processing programming languages need suitable data types. Strings are used in all modern programming languages to store and process textual information. Logically, a string - like any text - is a sequence of characters. The question remains what a character consists of. In a book, or in a text like the one your are reading now, characters consist of graphical shapes, so-called graphemes, consisting of lines, curves and crossings in certain angles or positions and so on. The ancient Greeks associated with the word the engraving on coins or the stamps on seals. In computer science or computer technology, a character is a unit of information. These Characters correspond to graphemes, the fundamental units of written or printed language. Before Unicode came into usage, there was a one to one relationship between bytes and characters, i.e., every character - of a national variant, i.e. not all the characters of the world - was represented by a single byte. Such a character byte represents the logical concept of this character and the class of graphemes of this character. 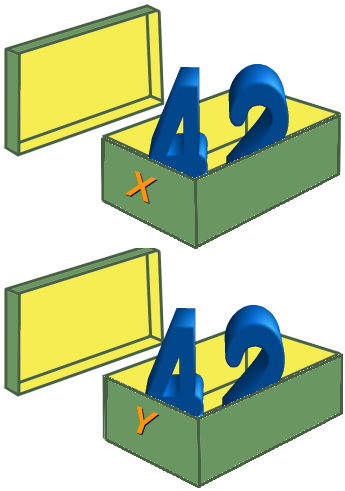 In the image on the right side, we have depicted various representations of the letter "A", i.e., "A" in different fonts. So in printing there are various graphical representations or different "encodings" of the abstract concept of the letter A. (By the way, the letter "A" can be ascribed to an Egyptian hieroglyph with a pictogram of an ox.) All of these graphical representations have certain features in common. In other words, the meaning of a character or a written or printed text doesn't depend on the font or writing style used. On a computer the capital A is encoded in binary form. If we use ASCII it is encoded - like all the other characters - as the byte 65. ASCII is restricted to 128 characters and "Extended ASCII" is is still limited to 256 bytes or characters. This is good enough for languages like English, German and French, but by far not sufficient for Chinese, Japanese and Korean. That's where Unicode gets into the game. Unicode is a standard designed to represent every character from every language, i.e., it can handle any text of the world's writing systems. These writing systems can also be used simultaneously, i.e., Roman alphabet mixed with Cyrillic or even Chinese characters. It is a different story in Unicode. A character maps to a code point. A code point is a theoretical concept. This means, for example, that the character "A" is assigned a code point U+0041. The "U+" means "Unicode" and the "0041" is a hexadecimal number, 65 in decimal notation. Up to four bytes are possible per character in Unicode. Theoretically, this means a huge number of 4294967296 possible characters. Due to restrictions from UTF-16 encoding, there are "only" 1,112,064 characters possible. Unicode version 8.0 has assigned 120,737 characters. This means that there are slightly more than 10 % of all possible characters assigned, or in other words: We can still add nearly a million characters to Unicode. It's a one to one encoding, i.e., it takes each Unicode character (a 4-byte number) and stores it in 4 bytes. One advantage of this encoding is that you can find the Nth character of a string in linear time, because the Nth character starts at the 4×Nth byte. A serious disadvantage of this approach is due to the fact that it needs four bytes for every character. Hardly anybody needs more than 65535 characters, so UTF-16, which needs 2 bytes, is a more space efficient alternative to UTF-32. But it is very difficult to access characters outside the range 0 - 65535, i.e. characters from the so-called "astral plane"
Another problem of both UTF-32 and UTF-16 consists in the byte ordering, which is dependent on the operating system. UTF8 is a variable-length encoding system for Unicode, i.e., different characters take up a different number of bytes. ASCII characters use solely one byte per character, which are the same as the used to be for the first 128 characters (0127), i.e., these characters in UTF-8 are indistinguishable from ASCII. But the so-called "Extended Latin" characters like the Umlaute ä, ö and so on take up two bytes. Chinese characters need three bytes. Finally, the very seldom used characters of the "astral plane" need four bytes to be encoded in UTF-8. A disadvantage of this approach is that finding the Nth character is more complex, the longer the string, the longer it takes to find a specific character. After this lengthy but necessary introduction, we finally come to python and the way it deals with strings. All strings in Python 3 are sequences of "pure" Unicode characters, no specific encoding like UTF-8. >>> s2 = "I am another string, but I am enclosed in double quotes"
>>> s3 = "It doesn't matter!" >>> txt = "He said: \"It doesn't matter, if you enclose a string in single or double quotes!\""
He said: "It doesn't matter, if you enclose a string in single or double quotes!" They can also be enclosed in matching groups of three single or double quotes. In this case they are called triple-quoted strings. The backslash (\) character is used to escape characters that otherwise have a special meaning, such as newline, backslash itself, or the quote character. A string in Python consists of a series or sequence of characters - letters, numbers, and special characters. Strings can be subscripted or indexed. Similar to C, the first character of a string has the index 0. >>> s = "Hello World"
Some readers might find it confusing when we use "to subscript" as a synonym for "to index". Usually, a subscript is a number, figure, symbol, or indicator that is smaller than the normal line of type and is set slightly below or above it. When we wrote s or s in the previous examples, this can be seen as an alternative way for the notation s0 or s3. So, both s3 and s describe or denote the 4th character. Btw. there exists no character type in Python. A character is simply a string of size one. It's possible to start counting the indices from the right, as we have mentioned previously. In this case negative numbers are used, starting with -1 for the most right character. "Hello" + "World" will result in "HelloWorld"
"*-*" * 3 will result in "*-**-**-*"
"Python" will result in "P"
"Python"[2:4] will result in "th"
>>> s = "Some things are immutable!" >>> txt = "He lives in Berlin!" >>> txt = "He lives in Hamburg!" The variable "txt" is a reference to a string object. We define a completely new string object in the second assignment. So, you shouldn't confuse the variable name with the referenced object! 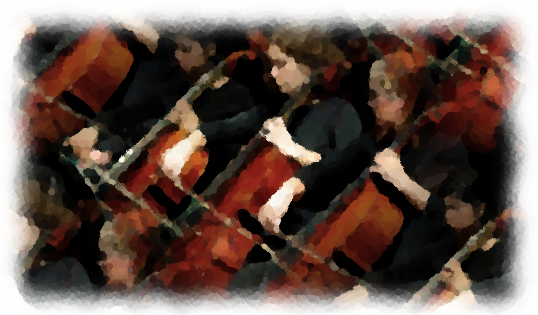 Strings show a special effect, which we will illustrate in the following example. We will need the "is"-Operator. If both a and b are strings, "a is b" checks if they have the same identity, i.e., share the same memory location. If "a is b" is True, then it trivially follows that "a == b" has to be True as well. Yet, "a == b" True doesn't imply that "a is b" is True as well! You are right, it has nothing to do with geographical places. The special character, i.e., the hyphen, is to "blame". To end our coverage of string in this chapter, we will introduce some escape characters and sequences. The backslash (\) character is used to escape characters, i.e., to "escape" the special meaning, which this character would otherwise have. Examples for such characters are newline, backslash itself, or the quote character. String literals may optionally be prefixed with a letter 'r' or 'R'; these strings are called raw strings. Raw strings use different rules for interpreting backslash escape sequences. Python 3.0 uses the concepts of text and (binary) data instead of Unicode strings and 8-bit strings. Every string or text in Python 3 is Unicode, but encoded Unicode is represented as binary data. The type used to hold text is str, the type used to hold data is bytes. It's not possible to mix text and data in Python 3; it will raise TypeError. While a string object holds a sequence of characters (in Unicode), a bytes object holds a sequence of bytes, out of the range 0 .. 255, representing the ASCII values.